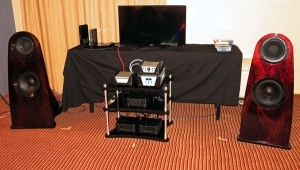 When I entered the On A Higher Note room on the Marriott's mezzanine, Synergistic Research's Ted Denney was talking about the sonic benefits of his new Atmosphere ($1995, the vertical black tower between the equipment racks in the photograph). "RF pollution affects how we perceive sound," Ted said," explaining that that is why our systems unpredictably sound good or bad. The Atmosphere, he said, creates a binaural RF field that swamps external RF pollution, allowing our perception to operate correctly. It affects the listener, not the system. Synergistic offers modules for $495 each that, with an iPad app, allow the Atmosphere's effect to be adjusted to the listener's taste; I think Ted said there were 4096 possible combinations available, with each module offering four. "Yeah, right," I was thinking. Ted played music on the Mola Mola/Eclipse/Luxman system with the Atmosphere turned on, to get listeners used to the sound, which was indeed excellent. He then turned off the Atmosphere and to my shock, given my skepticism about Ted's claims, the sound did indeed get worse, the soundstage shrinking and a hard edge appearing to midrange sounds. WTF!?!?! My world tilted a little. Still in a state of shockI knew what I had heardI asked Ted for more detail. The Atmosphere is said to generate very-low-frequency radio wave at the Schumann Resonance Frequency and its harmonics. Schumann resonances occur because the space between the surface of the Earth and the conductive ionosphere acts as a closed waveguide and the fundamental frequency is around 7Hz. This did nothing to dispel my skepticism: an antenna that could efficiently propagate radio waves with such a low frequency would have to be small country-sized, not a slim tower. But something was going on here. On a Higher Note is the US distributor for the Dutch company Mola Mola, for which the famed Bruno Putzeys, of Hypex class-D module fame, is the designer. I wondered if having Bruno (left) in the same room as Ted Denney would result in the equivalent of matter annihilating antimatter. 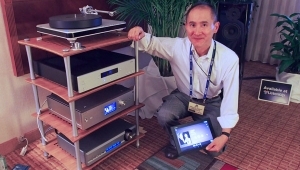 All was well, however, as Bruno demonstrated how all the loading options and possible variations on the RIAA curve on the optional phono stage of the Mola Mola Makua preamplifier could be controlled with an Android app communicating with the preamp via Bluetooth. 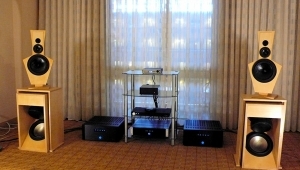 (The Makua costs $13,500 in basic line-level form, with the phono module adding $2500 and a DAC module $5000.) 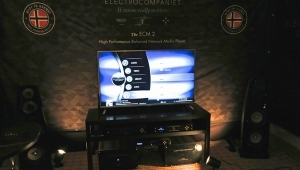 With a Soundsmith Hyperion cartridge mounted on a Luxman turntable, the rest of the system comprised a pair of Mola Mola monoblocks ($18,000/pair) driving the full-range Eclipse speakers with optional subwoofers that I had written about in my report from the 2014 CES, Bruno remotely changed loading and EQ with abandon while playing Allen Toussaint's The Bright Mississippi, and there were no switching transients at all, just tangible imaging and the expected changes in EQ and tonal balance. Channel D's Rob and Claudia had thoughtfully pinned-up their playlist of 24/192 vinyl rips, made with the Pure Vinyl 4.0 app, and the Channel D SetaL phono preamp, to the door of their room. Inside, Joseph Pulsars were bring driven by a Hegel H20 amplifier, with source a Lynx HiLo D/A converter. 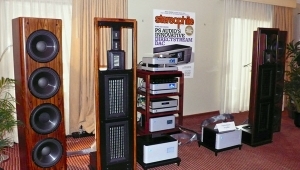 This was the ninth year Channel D had exhibited at the Denver show. The sound of the rips, played on a Mac mini quad-core i7, with 16GB of memory, with RIAA equalization applied in the digital domain, was simply superb, even if Rob Robinson's taste in music is a little more "alternative" than my own. Herb Reichert already reported his experience listening to the NOS pair of Infinity IRS Betas in the PS Audio room, but for me it was a privilege to be able to chat in that room with the Beta's designer Arnie Nudell (top) and the designer of PS Audio's new PerfectWave amplifier, Bascom King, whose reviews for Audio magazine I used to devour. 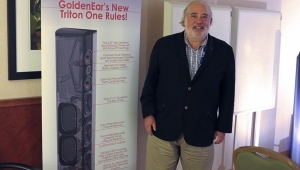 Both men are responsible for much that is best in high-end audio reproductionwe are in PS Audio's Paul McGowan's debt for bringing these audio legends to the RMAF. 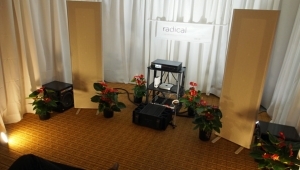 But what I most wanted to hear from PS Audio was in the Colorado company's smaller room, where the new Sprout D/A integrated amplifier was driving a pair of GoldenEar Aon3 stand-mounted speakers. Paul son Scott McGowan had set this room up as if it were his living roommuch of the furniture inside actually was from his living room, Paul told meand the entire system, with turntable, cost less than $2000! The nicely proportioned Sprout, the result of a Kickstarter fundraising campaign, includes a phono stage, AptX Bluetooth, and a 24/192 asynchronous USB port, and will cost just $799. Paul described the Sprout as "a lifestyle product, one that can be plunked down, connected and enjoyed." A product like this may well the key to exposing true high-end audio sound quality to a new generationHerb Reichert has received an sample from the first production run for a Stereophile review. 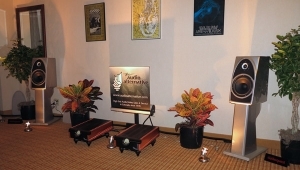 At the 2013 RMAF, Ayre Acoustics had dressed up their room on the Tower's 9th floor to resemble a used record store, so I wasn't sure what to expect at this year's show. "The Twenty Club?" What the heck? All became clear when I entered the Twenty Club and sat at my table: the KX-R Twenty preamplifier was performing, using a vintage Shure Unidyne SM55 microphone, accompanied by a pair of MX-R Twenty monoblocks and a one-off pair of Vivid speakers. The "Twenty" refers to Ayre's 20th anniversary year and I was familiar with the KX-R Twenty preamplifier, having literally finished writing a rave review of it just two days before flying out the show. I hung out at the club for a while, listening to Neil Young accompanying himself on piano. The cocktail waitress never did arrive to take my order, however, so I had to move on. But not before deciding that I would ask Ayre for review samples of the MX-R Twenty! "Are those Ionovac tweeters?" 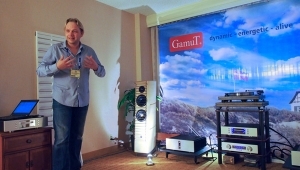 I asked Wavelength's Gordon Rankin, pointing to the horn-loaded ion drivers on top of the Vaughan speakers in his room. They were indeed Ionovacs, Vaughan having bought the entire remaining NOS stock of this legendary tweeter, and after rebuilding it, using it to reproduce signals above 3.5kHz. An Accuton driver is used down to 80Hz, with then a 10" subwoofer providing the low-end grunt. With the speakers driven by 8W Wavelength Napoleon monoblocks and for the source, a computer feeding the new DSD-capable Crimson DAC, there was indeed something quite magical about the quality of the high frequencies in this room. The cymbals and shaker on Lyle Lovett's "North Dakota" sounded extended, detailed, and smooth. Nice. Very nice. 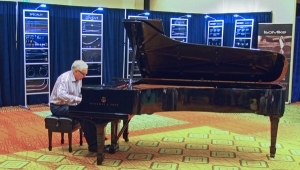 I have already written about Ray Kimber bringing classical pianist Robert Silverman to the 2014 RMAF. 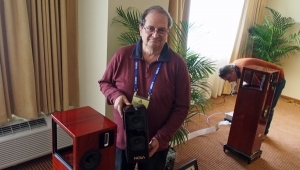 Following Bob's Sunday-morning recital, I went into the other Kimber room at the Marriott to listen to the system Ray had put together using Sony SS-AR1 speakers ($27,000/pair) driven by the humongous EMM Labs MTRX 1.5kW monoblocks. I had recorded Bob Silverman performing the Schumann Symphonic Etudes in 2008 for release as a Stereophile CD, but that never happened. Instead, Bob released my recording, coupled with another engineer's recording of the Brahms Handel Variations, as an OrpheumMasters CD and listening to that CD on the Kimber/EMM/Sony system plunged me back into the glorious acoustic of Goshen College's Sauder Concert Hall in Indiana, where I had captured the perfomance. One of my best sounds of the 2014 RMAF and one day I must make the hi-rez masters available for download. Because Stereophile's four writers at the show, Herb Reichert, Thomas J. Norton, Jason Victor Serinus, and myself, were busy listening to musicwe love our jobs!we couldn't spend much time at the Stereophile stand. My thanks, therefore, to Laura LoVecchio, who made sure that on the first two days of the show, the Stereophile stand was populated with the November issue, which was so hot off the press that it was mailed to Denver directly from the printer. Based on our experience at earlier shows, we had ordered what we thought would be sufficient stock for showgoers. But demand was so great that we ran out copies by Saturday evening! Since your world "tilted" and you're hearing quite significant changes in the sound waved hitting your ears, please request this device for review and testing! Surely you must be very curious about the technology and need to understand how this works. Since your world "tilted" and you're hearing quite significant changes in the sound waved hitting your ears . . . I don't believe there was any change in the "soundwaves reaching my ears." What changed, I am convinced, was my perception of those soundwaves. please request this device for review and testing! In that light, what would I test? I too definitely heard greater soundstage proportions and three-dimensionality with Atmosphere and its module engaged. The demo was 100% convincing. The thing works. 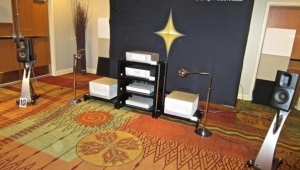 Having said that, the problem for me, however, was that Ted Denney's many other products in the room - ART, HRT, FEQ, and others both active and passive that he introduced for the first time at RMAF -- were so effective that, to my ears, the soundstage was already mind-boggling large and three-dimensional. The addition of the The Atmosphere made the experience virtually holographic. That was cool, to be sure, and worked really well. But I'm not sure it contributed to a greater sense of you-are-there musical reality. That, of course, may be because I had never heard anything quite like it before, and wasn't familiar with what the combination of components in the room could do without the addition of all the Synergistic devices. John mentions the 4096 possible permutations and combinations. I found so many choices more than a bit daunting. Having so many possibilities that can be changed at the touch of an iPad took me back to one of those boys-with-their-toys scenarios that drove me nuts when I owned Michael Green tunable loudspeakers. It can be a lot of fun if you don't obsess. But if you do, as I most certainly did, watch out. When all is said and done, I consider Ted Denney one of the most gifted and boundary-breaking mavericks in our industry. HIs mind keeps working, and he keeps on coming up with new devices and approaches that don't merely push the envelope - they shred it entirely. Those of us who can keep up with him reap the benefits, both sonically and spiritually. The more engaging the musical experience becomes, the more enriched we are. I have it on the head shell of my turntable now. I could swear I notice the same effect I noticed at the show. Like John, I'm not sure if I haven't talked myself into it. "WTF!?!?" from John's comments pretty much sums it up. I find this idea of not having any "soundwave change" curious. It sounds like this is the rationale that Synergistic gives (or one that they want folks to believe); but how do we know this is true? Surely if you can perceive a difference as best you can tell (the *sonic* experience is different with essentially a flick of a switch), then isn't it reasonable at least to try to explain it first using standard physics. I'm sure most thoughtful readers would appreciate this. Wouldn't it at least be worth testing if this device changes the frequency response of the room for example since this seems to be acting like a form of add-on room treatment (whether Synergistic calls it such or not). Maybe the RF effect changes other things in the sound system - distortion levels of DACs or other electronics that might be nearby for example. Surely it's worth reporting on these most basic of tests to educate the potential customer. If truly this works outside the usual physical parameters of sound reproduction and for sure we know this "works", then perhaps we're looking at a true breakthrough! Wouldn't it be good for the magazine to explore this possibility and do its best to advance the science of audio reproduction? I find this idea of not having any "soundwave change" curious. I think you are assuming that what we perceive as "sound" is identical to the properties of the soundwaves.The latter can be measured, the former cannot, as it is an internal construct by the brain. 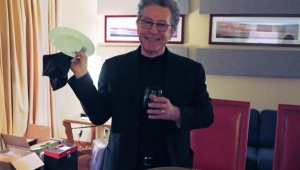 See my discussion of perception in my 2011 Richard Heyser Memorial Lecture: www.stereophile.com/content/2011-richard-c-heyser-memorial-lecture-where-did-negative-frequencies-go-nothing-real and my example of the 1kHz tone. Wouldn't it at least be worth testing if this device changes the frequency response of the room for example since this seems to be acting like a form of add-on room treatment (whether Synergistic calls it such or not). Measuring a system's in-room frequency response is too coarse a tool to detect any changes that might be due to this device, in my experience. Maybe the RF effect changes other things in the sound system - distortion levels of DACs or other electronics that might be nearby for example. Except the fundamental frequency is so low that electronic products will be dreadfully poor antennae at picking up such RF. Yes, the harmonics becomes increasingly high in frequency but the power in those harmonics is even lower in energy, assuming that Ted Denney is correct in his description of what the Atmosphere is. However, suppose for a moment that Synergistic is right and the effect has nothing to do with "soundwaves" and it truly is a breakthrough of sorts. Then what are we to think? This device somehow changes brain functioning directly? Many things can do this. Want a bigger soundstage and you live in Colorado? Smoke a joint. The effect is predictable and repeatable, but it has nothing to do with the properties of soundwaves and everything to do with perception being affected by the direct effect of the drug on the functioning of our brain. I think Stereophile has a policy. . .
Review it, don't test it. How different was your perception? Tell us how the sound changed. Learning how the sound improved (or not) is what I want to know. I buy components for how they sound, not for how they test. Count me in! I am was an old subscriber to both Audio Magazine & Stereo Review. Again, thanks for all the effort. We audiophile voyeurs appreciate it. I'm curious with so many exhibitors, how you decide which ones to blog about. Our goal is to write something about every exhibitor, but that just isn't possible. Rooms tend to get omitted from our coverage for a number of reasons. If they are focusing on home theater, they tend to get passed by as we leave that subject to our sister magazine Sound&Vision. Similarly, we left almost all the CanJam coverage to InnerFidelity.com, detailed writing on new computer audio gear to AudioStream.com, and new analog product reports to AnalogPlanet.com. Some rooms are making such poor sound that we move on, the exhibitors not being able to deal with the poor room acoustics with which they are saddled. Sometimes, an exhibitor will be too busy having a conversation to play any music; while we try to return at a better time, that is not always possible. Sometimes a room is showing the same system and playing the same music that we reported on in our report from another recent show, so we give that room a lower priority. And finally, we just run out of time. I also want to chime in that folks like John also have folks like me (Stereophile Reader) coming up to them to talk. John talked to me for a bit, which I really appreciated. 1) The room is so important. It is very difficult to get great sound from a small room. 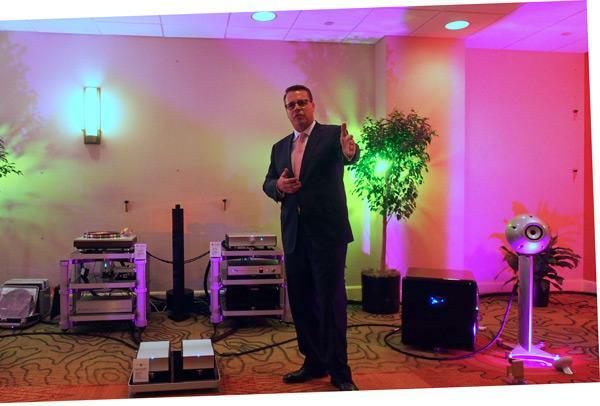 2) For speakers, $5,000 gets me to what I consider to be exceptional sound. 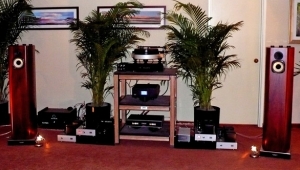 Afterward, I evaluated my favorite rooms, and in every case the speakers were $5,000 per and up. That's not to say there are good speakers below that. Also, I'm not saying that all $5000 pair speakers are good. I'm talking about the point where you get into speakers where things start to really come together and there are no obvious shortcomings. I went into the show thinking I needed to look at DACs or cartridges. I came out thinking I need better speakers. Thank you for this great commentary on the wonderful RMAF. So, which speakers did you like? Meant to reply to your comment. ...That sounds like a description of pretty mediocre sound reproduction when the un-rationally explained device is off. "The sound did indeed get worse, the soundstage shrinking and a hard edge appearing to midrange sounds." For stuff a bit out of my price range ( daughter going to college next year), I liked the Lanche speakers on the first floor conference room, Pioneer speakers in the Acoustic Sounds room, Gamut, YG Acoustics, TAD and the Wilsons in the VTL room. I also really liked the Goldmund speakers that you could also stream to wirelessly, however, I'm skeptical about a speaker with an onboard DAC in the ever changing digital arena. In my price range, I liked the Vandersteen Treo speakers. They sounded really good in the Audioquest and (if I'm not mistaken) AURALiC rooms. I tried to attend rooms with speakers i haven't heard and ones I can't easily go to listen. I liked the ZU Audio speakers on the Mezzanine level and the BMCs. 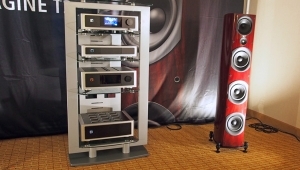 Ones that I would really like to hear in a different room were the Chapman and Audio Kinesis speakers. I always wanted to hear Harbeth speakers, but was unimpressed. Like I said, I didn't make it to places like Monitor, Magnepan, B&W, Vienna Acoustics, etc. I can get to places that I can listen to those. The most interesting was the Linkwitz room. Great sound from a weird speaker made of PVC and a larger one that looks like something you would buy from IKEA. The highlight of the trip was the DSD trip where we were bused to Boulder and watch a DSD recording in progress. Gus, the Audio Enginer, explained the process and then played DSD recordings in their playback system. He also got permission to play a couple cuts of an unreleased Roger Waters album. It was beyond cool. The 2 hours flew by. My first inclination would be to put this device on a completely separate circuit to make sure it wasn't some line conditioning effect. If that produced the same perceived effect, then I'd conduct--dare I say?--a blind A/B text on 100 people, one at a time, and look for statistical significance in the results.